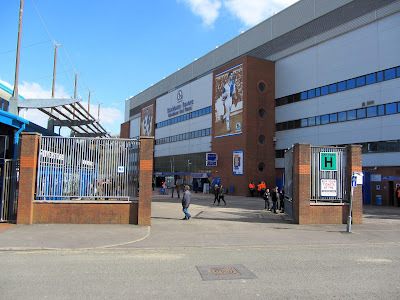 My sixth stadium of 2013 was on Friday 29th March 2013 at Ewood Park in Blackburn, Lancashire. 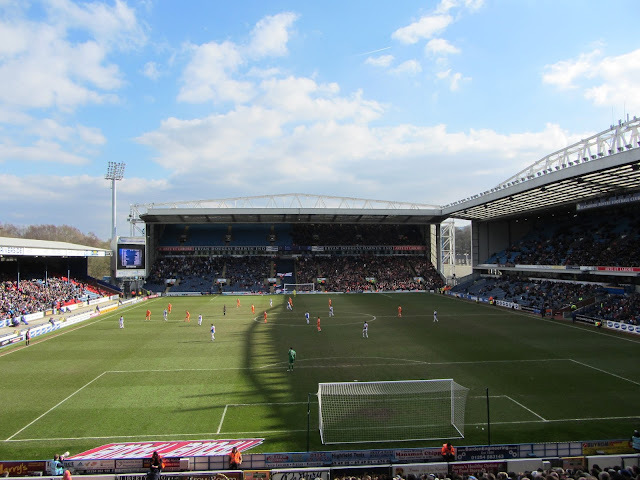 The match was Blackburn Rovers vs. Blackpool in the Football League Championship. 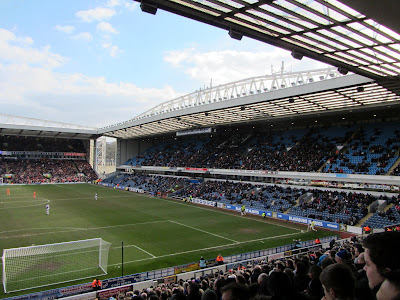 Ewood Park is located to the south of the town centre and is mostly surrounded by housing though the eastern side of the ground backs onto a wooded area. The stadium is just under a mile from the nearest railway station at Mill Hill with the better serviced Blackburn station 1.5 miles away. Ewood Park was built in 1882 and the club have played there since 1890. Three sides of the ground were extensively redeveloped in the mid-1990s with only the Riverside Stand on the eastern side of the venue not updated during this period. This stand is the only single-tiered structure in the stadium and can house around 4,000 supporters. There are eight supporting pillars which hold up the roof providing cover to the back section of the stand. The fans in the front section remain uncovered. The remaining three stands are all two-tiered with executive boxes in between the two tiers. The 11,000 seat Jack Walker Stand runs alongside the pitch on the western side of the stadium contains the dressing rooms, media centre and premier hospitality section. 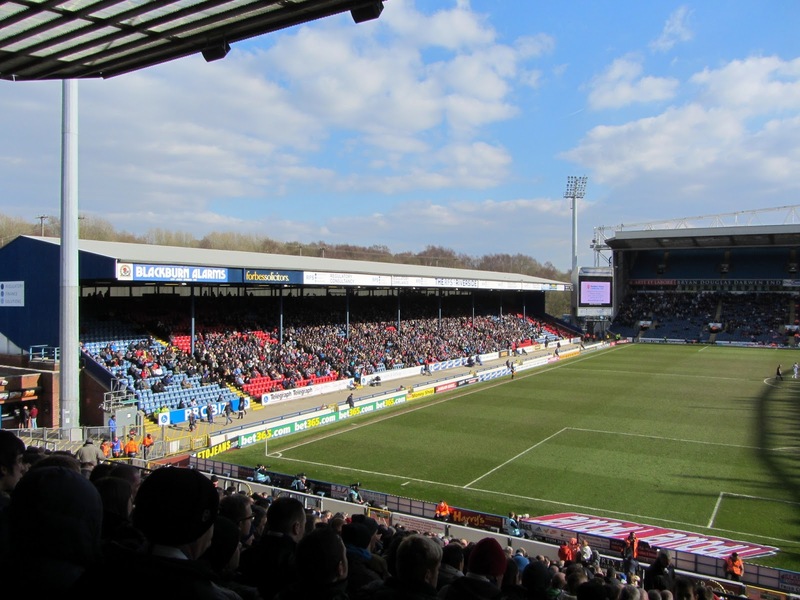 The stands behind each of the goals are similar in nature with both providing around 8,000 seats. 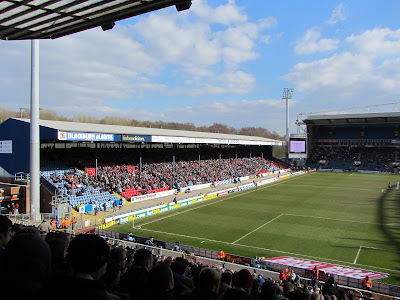 Behind the goal at the northern section of the venue is The Blackburn End and behind the other goal is the Darwen End. This end is split between home and away supporters. The game was pretty poor in the first half. Blackpool played some neat passing football with Tom Ince causing problems for the Blackburn defence, but there were no clear-cut chances for the visitors. Blackburn had the best opportunities of the half with Grant Hanley coming closest after a penalty box scramble. The game livened up in the second period and Blackburn really should have been ahead in the 54th minute when David Jones rounded Blackpool goalkeeper Matt Gilks only to lose his balance and blaze over the bar. Josh King also had a good opportunity to score for the home side a couple of minutes later when he shot over from six yards. Surprisingly though it was the visitors who opened the scoring in the 64th minute. This was against the run of play but the hosts failed to react quickly enough when a corner was nodded onto Gary Mackenzie who steered home from close range. The home side kept up the pressure and in the 79th minute finally got their reward when Jordan Rhodes headed home from six yards out after good work from Todd Kane. In the closing stages of the match the visitors came back into it and a good Jake Kean save was required to prevent Nathan Delfouneso's header from ending up in the back of the net. This secured a point for Blackburn with the match ending 1-1.